Just a few weeks ago, Pam Bailey wrote an NPQ article about some efforts to get out the vote, and others to block it. In that article were some harrowing statistics about how poor the voter turnout has been of late, especially at midterm elections. (Just as a reminder, four years ago, in 2014, the turnout was 34.7 percent, the lowest in 70 years.) The article also covered the fact that voter turnout among people of color has been particularly low. The Brennan Center for Justice reckons there have been 99 bills to restrict voting rights in 31 states around the nation, many of which seem designed to suppress the vote of people of color. Another group that is under-represented at the polls is young people. According to a recent report by the Pew Research Center, millennials, post-millennials (whatever that group is), Gen-Xers, and Gen-Zs make up the largest portion of the American electorate, at 53 percent collectively, but cast 21 million fewer votes than Boomers in the 2014 mid-term election. Contrast all of this, however, to the activism that is increasingly reflected in the growing number of candidates of color, women, and youth standing for office, and we may see a very different scene at this year’s high-stakes midterms. (We certainly hope so.) NPQ will be talking a lot over the next month about various ways of getting out the vote, because it’s undeniable how very high the stakes have become. To start you off on developing your own action plan, here is one serious faith-based effort, and one that’s more lighthearted and kitschy. Megan Black, organizer of the progressive Faith in Action, is quoted as saying that politics is no longer something that should be avoided. Her group is looking to touch one million people personally, especially in places with low turnout, urging them to vote. At a progressive theological seminary in Virginia, one first-year student is quoted as saying he’s passionate about voting because “I want…to say, you know, I believe in Jesus Christ and I believe in liberal progressive values.” He made this statement following a gathering at a pub in the seminary where students were encouraged to register and vote. A related initiative in the faith community that’s focused more on getting out the vote of people of color in the central city is called Souls to the Polls. This works with central city churches, activating the congregation to not only vote but to go out into the neighboring community and encourage area residents to vote also. In the Milwaukee version, for example, over 100 churches are participating. 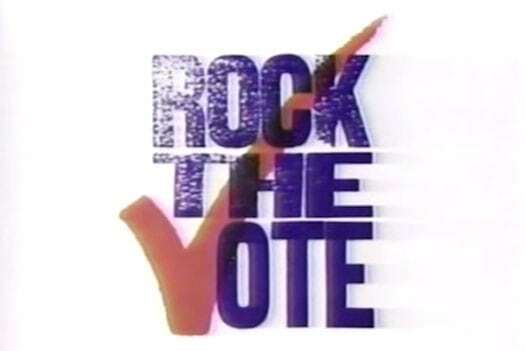 On a more lighthearted note, a call was raised at Mashable to get young people to vote by—wait for it—bringing back the wacky 1990s version of Rock the Vote! “We’re just a month away from the midterm elections, so…where’s Megadeth when you need them?” writes reporter Heather Dockray. While taking nothing away from the modern version, starring such luminaries as Miley Cyrus encouraging young people to vote, Dockray longingly recalls the days when Madonna pranced around, draped by a US flag and flanked by jeans-shorts wearing dancers. Or Anthony Kiedis of the Red Hot Chili Peppers going shirtless as he extolled the importance of voting.